Ridinger, Johann Elias (Ulm 1698 – Augsburg 1767). The Deer’s Four Times of Day. Set of 4 sheet in etching & engraving. C. 1746. Inscribed: J. E. Ridinger Pictor ac Sculptor Augustan. (1) and J. E. Ridinger fec. (2-4) resp., otherwise as following, with the respective motto each above the oval picture the corners of which are hatched out. 13½-13⅝ × 10¾-11⅛ in (34.3-34.6 × 27.7-28.2 cm). Thienemann + Schwarz 238-241; Art Stock Catalog Weigel XXVIII, Ridinger supplement (1857) 19 A; Nagler 26; Silesian Ridinger collection at Boerner XXXIX (1885), 1800 (only “Fine new impressions”); Ridinger collection Reich auf Biehla (1894) 26 (only “Newer impressions”, presumably those about 1850); George Hamminger Collection 1601 ( “Very rare set”, 1895 ); Helbing XXXIV (J. E. & M. E. Ridinger, 1900), 500 ff. with pl. IV in “fine later impression”; Schwerdt III, 138; cat. Halle 68, Plate Books of the XVIIth and XVIIIth Cent., 337 (“Wide-margined fine impressions”, 1928). – No copy in the Coppenrath Collection (1889/90) & Rosenthal’s listing 126 (Joh. El. Ridinger, 1940, 444 items). with watermark WANGEN as the quality particularly esteemed by the Ridingers. Margins above & below 5-6.8, laterally 1.9-3.2 cm wide, at the left the old stitching edge. The Evening sheet with pinhead-small abrasion in the rock part above the group of three, otherwise prime. as by the fact that it was missing in notable Ridinger collections of the 19th century either entirely (Coppenrath) or was present in new impressions from/after 1850 only (above Silesian and that of Theodor Reich). But even Georg Hamminger, Ridinger market sweeper of his time, owned it in contrast to numerous other works by the master only once complete and beside a precious discharge print of the first sheet just two individual sheets trimmed to the subject. And in 1900 the Ridinger wholesaler Helbing, likewise known for his umpteen duplicates in all states, could complete his only copy by one later impression only. And the missing of the set in the representative exhibitions to the 300th birthday accompanied by adequate catalogs, so the 18-month Polish touring exhibition of the National Museum in Kielcach/Kielce 1997/98 and the one in Darmstadt at the Hunting Seat Kranichstein 1999 finally puts the unchanged situation of our days into a characteristic light. For the brocket the drawing Weigel, 1869, no. 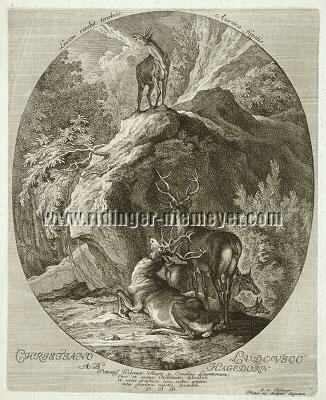 133 – “A Languishing Stag standing on a Boulder”, black chalk heightened with white, on blue paper – should have been used as copy, inscribed by Ridinger with “in silva Nymphenburg (Munich) , ad vivum delineavit J. E. Ridinger 1738”. – As a whole the composition should be related to the oil given to Johann Elias in the 1978 exposition Jagd einst und jetzt of the Lower Austrian State Museum at Marchegg Castle – no. 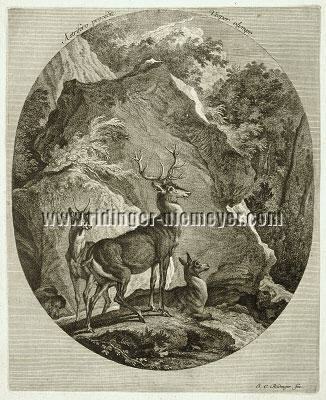 129, 17½ × 14⅝ in (44.5 × 37 cm), for the pendant see the noon plate – described as “… shows a rocky landscape with stags and deer”. Having entered upon Electoral Saxon service in 1735, Hagedorn was promoted Legation Councilor in 1743/44 (Privy in 1763). There is no insight here yet about the occasion for Ridinger’s distinguishing unique dedication. transferred to copper – “J. El. Ridinger ad viv. del. et fec.” – in 1746/48, yet hardly before 1747. By a water supposed to be the bay of a lake this scenery shows aforesaid group of four on a boulder above the water and at the same time at the foot of a rock projecting into the subject, and on the other hand at the opposite forest edge another royal one with a seraglio of seven. might withal prove identical with the one with the equal worded caption in Weigel, 1869, no. 130, and by this as related to Th. 241, see the following scenery. Among the changes of details of an oil of the complete composition Th. 293 traded here the situation of the water below the right foreground group proves to be remarkable as, contrary to the copper, distinctly staging a flowing off (that of the Würm?). (Stefaan Hautekeete [ed.] 2007 in the exhibition catalog Holland in Linien – Ndl. Meisterzeichnungen des Goldenen Zeitalters aus den Kgl.-Belg. Kunstmuseen Brüssel, p. 7/I). In respect of the number this group corresponds with the one placed above the water at the edge of the forest of Th. 293 whose capital one just doesn’t show 16 points. 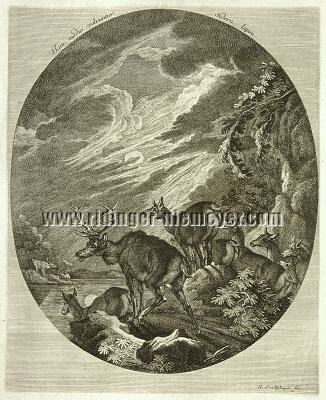 – Thematically by the way certainly also belonging to the unmarked drawing Weigel 169 A woodland with a stag and ten standing and resting hinds; a rutting stag beyond a river doesn’t dare to come near. On bluish paper, Indian ink, heightened with white, oblong roy. f.”. and each from personal local take. 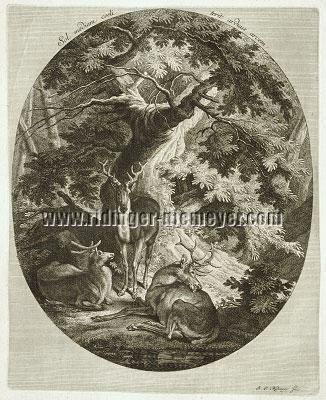 The master’s then preference for the Munich environs besides proven as evidenced by inscriptions of drawings/engravings 1736 & 1738 for Starnberg (Weigel 130/Th. 293; collection of Ridinger drawings at Wawra, 1890, no. 56 [“Stag on a Hill moving towards the Wood, inscribed Ad Vivum in Silva Starenbergensis Joh. El. Ridinger 1738”, chalk on blue paper, heightened with white, large fol.] & possibly also Th. 269) , for Nymphenburg 1731 (Th. 287, “in the Park of Nymphenburg towards Stahrenberg …”) & 1738 (Weigel 133/Th. 238) , possibly 1734, too, (Th. 274) and possibly/presumably for Schleißheim 1735 (Th. 282) , 1736 (Th. 270) & 1738 (Wawra 55, “Stags in the Wood at Schleissheim. With the master’s name and … 1738 …”, chalk on blue paper, heightened with white). additionally embedded into a local sphere of highest pretension . (Justus Müller-Hofstede on occasion of the Savery exhibition Cologne 1985, Frankfurter Allgemeine Zeitung Nov. 10, 1985). (Wolf Stubbe, former director of the print room of the Hamburger Kunsthalle, equally bound up with 18th and 20th century, in Johann Elias Ridinger, Hamburg/Berlin 1966, pages 10 & 13). “ the most important Augsburg landscapist of this time ”. perceived immediately as unity”. A making aware which for instance also Karl Sälzle followed, who reports in the 1979 catalog of the German Hunt Museum how the master’s landscape design became the basis of the dioramas there. Being able to suggest his present, never repeated set for bold grab once more after only recent passing through of a copy should not let its rarity confirmed of old fall into oblivion. Its coming in was just as unforeseen as its present quality impresses.